The Carolina Bird Club visited the Blue Ridge Parkway in northern North Carolina and southern Virginia the weekend of September 13-14, 2014 as part of our "bonus trip" offerings. Based in Sparta, we explored north and south on the Parkway, searching for roving flocks of fall migrants. While statistically not one of the wetter months, I seem to have a knack for finding just that weekend in September when a cold front passes through the area. In fact, I cannot remember the last time I was on the Parkway birding in September that it did not rain, and such was the case this year. Don't get me wrong, unsettled weather can be a boon to birding, at times resulting in nice numbers of birds that have no place else to be since the weather is not good enough to continue migration, but the problem on the Parkway in northern North Carolina is that it runs along the crest of the Blue Ridge, and is thus some of the higher terrain in the area. And that terrain is often high enough to kiss the clouds, resulting in fog. And fog is not really conducive to a good day's birding. So while the overall forecast could have been better, we drew at least one or two face cards when it came to the ceilings, as most of the day on Saturday we were able to find locations that were both reasonably dry with reasonable visibility. 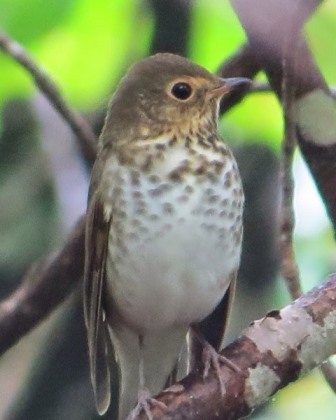 We found flocks of migrants, especially warblers, scattered up and down the parkway, but it only takes that one big flock to make the weekend, and we found it in the picnic area at Cumberland Knob. The furious tornado of warblers included Blue-winged, Bay-breasted, Blackburnian, Cape May and others, totally nearly 15 species. Orioles, grosbeaks, tanagers and thrushes join in the fray, making for one of those "I don't know where to focus my binoculars next" birding experiences. After an hour or so the flock dissolved as quickly as it materialized, leaving us spent, but still wanting more. Other highlights on Saturday included an Eastern Screech-Owl responding to the trilling of the guide, drop dead looks at an inquisitive Swainson's Thrush, and seventeen species of warbler. The cloudy skies and low ceilings precluded much in the way of a hawk watch on Saturday, and with a favorable forecast for Sunday, we planned a return to Mahogany Rock to watch the southbound raptor train. Of course weather forecasts are just guesses, and some of those guesses are terribly wrong. As was the case on Sunday. The blue skies we expected materialized as fog and drizzle, and even the die-hard hawkers decided to stay home. So for the first time in memory, a September trip to the Blue Ridge missed Broad-winged Hawk. I think the best story of the weekend occurred when we were all standing alongside the Parkway in a beautiful field of yellow fall flowers, training binoculars on one of those confusing fall empids. The "Traill's Flycatcher" put on a good show, and the sight of a bunch of people standing alongside the road often slows traffic. Most speed up and get out of Dodge as quickly as possible once we tell them that, no, we are not looking at bears. Well, this car slows and stops, the woman driving leans out the window, surveys the group peering into a willow through binoculars and asks, with all seriousness, "are ya'll fishing?" And no, there was not a stream or creek anywhere nearby.